Douala, Cameroon, has a long way to go before getting into a NY Times or AFAR must-see destination list. However, it is the gateway to the scenic Western portion of Cameroon. Douala is the commercial hub and the largest city of Cameroon (about 3 million inhabitants), albeit not the political capital, which is Yaounde. Unfortunately urban development went haywire, and it has become a very disheveled-looking city, with the exception of the administrative and diplomatic neighborhoods, formerly where the colonizers lived. The climate doesn't help, as it is very hot and humid. However, less than 10 kilometers out of the city, the scenery starts changing. On the road to the west, after the Wouri River bridge, post-colonial homes dot the roadside. By the time one reaches Melong, most people’s means of transportation is their feet. Many of these rural village dwellers work in small-scale agriculture. Further west, and uphill into Bamiléké country, the towns still lack architectural identity, or rather lost their identity in the years since the Europeans took control of what was known as The Cameroons in the late 1800s. Nestled in the hills are a multitude of McMansions, far larger than any in the United States. Some are designed by contractors and draftsmen, and a few are designed by local or foreign architects. These homes usually belong to the well-off Bamiléké merchants and professionals who left their natal village to gain fortune in Douala and sometimes Yaounde, but return to their original village to build their “true home,” where they can relax and retire. Who can blame them--land is still plentiful and the climate is pleasant, far from the Douala steam-bath. Here you can still find grasshoppers and butterflies, that disappeared years ago from Douala. West Cameroon is still the breadbasket of Cameroon, thanks to the climate, the fertile earth and the agricultural know-how of the Bamiléké people. They developed an efficient agricultural system which has been analyzed by research centers abroad. As per Wikipedia: "The Bamileke are skilled farmers who exploit virtually every strip of land available." From time to time, along the road, you’ll stumble upon a waterfall; some are really magnificent, such as the Ekom waterfall, about 40 kilometers away from Bafang. For less risky food choices, the town of Bafang has the Hotel La Falaise, slightly run down (the owner seems to prefer to invest in South Africa nowadays) but still a place to have a decent breakfast or lunch, albeit not at any hour; we passed by around 3 pm and nothing was left. 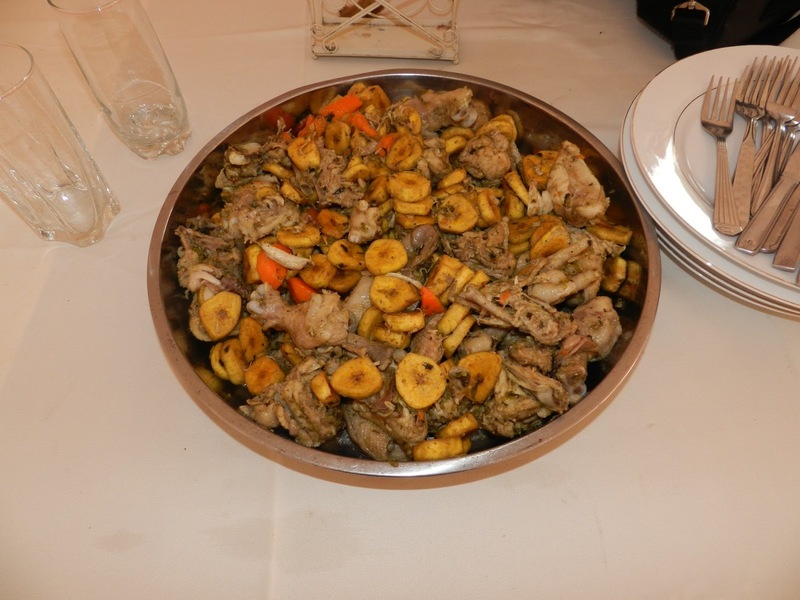 One of the appealing popular dishes often eaten in West Cameroon is “Poulet DG,” a fragrant stew of chicken, fried plantains, ginger, carrots, and green pepper. Lodging in West Cameroon is either at a friend or family member’s home, or in an inn, such as 3T in Banka, close to Bafang. The owner is very welcoming, and cooks up a mean dish of Poulet DG or even innards. For a glimpse of what Bamileke architecture used to be, Bandjoun is a must-see, for a few well-maintained structures. Dschang, about 5 hours by car from Douala, used to be the retreat for the European colonists. The Centre Climatique is a little worn down since its glory days, but rooms include a fireplace which is needed during the rainy season. This is one of the rare places in Cameroon where you’ll need a sweater from time to time. Yaoundé is the political capital of Cameroon; its population is about half of Douala’s. It is located in a hilly region, and the climate is very pleasant. The only disagreeable geographical issue is the red dust that settles everywhere. Leaving Douala for Yaoundé in the early morning used to be a losing proposition in which a car could be stuck in one place for 45 minutes, because of the armies of motorcycle taxis arriving into town from the opposite direction and used to take up all lanes, incoming and outgoing. Now soldiers and police are posted all along the way and do their best to keep some order so cars can leave the city to get to the road to Yaoundé and intermediate towns such as Edea and Pouma or other points in the center of the country. Unseen from the main road on the outskirts of Douala, in the “quartier," the non-urbanized neighborhoods with dirt roads and wood plank or cement homes, there is an enormous population living, if not exactly thriving. The road between Douala and Edea is sparsely populated, dotted with simple homes in recycled wood plank or poto-poto (earth mixed with straw). Edea is the main town on this road, about an hour away from Douala; this is where Cameroon electrical power comes from. About halfway to Yaounde is Pouma, known for its stone, from which slabs are made, used in Cameroonian kitchens to grind spices on. Yaounde’s outskirts are also a continuous marketplace, wares displayed right on the sidewalk. In the center of town you’ll find all the ministries and other government institutions as well as embassies. The most luxurious hotel in Cameroon is the Yaoundé Hilton, similar to any luxury hotel in the world, and lunch costs more than in New York City ($30 for a buffet, albeit quite nice)!